Fremont, CA. 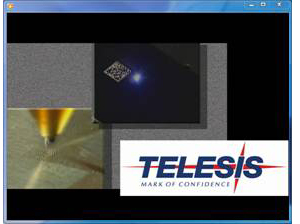 April 4, 2012 -- Telesis Technologies, the leader in product identification technologies announces the release of a new product video showcasing laser and Pinstamp technologies for the production of QR 2-D barcodes. This video highlights the ease of programming the value priced EVC vanadate laser marking system using the Merlin® II LS and the generation of QR codes using the TMC470 controller for our PINSTAMP® marking systems. Telesis’s versatile Merlin® Visual Design software has an intuitive graphical user interface that makes marking pattern design quick and easy. CAD and graphics files can easily be imported and a number of different types of barcodes can be generated with alphanumeric and variable text data. Telesis Technologies Inc. is a world leader in manufacturing standard and customized permanent parts marking equipment and systems—including gas, solid state and fiber laser, mechanical PinStamp®, and BenchMark® dot-peen systems and TeleScribe® scribe marking systems. Since 1971, Telesis has provided durable and accurate parts marking capabilities to companies the world over, from small shops to Fortune 100 manufacturing firms and governmental organizations. Telesis is now the most trusted brand in the parts-marking industry. For more product information and to view our other videos, please visit Telesis Technologies on the web at www.Telesis.com.